With spring upon us, there are great things to look forward to, including the much-anticipated prom. High school has its ups and downs but there is no doubt prom is a memorable event most teenagers love, so looking and feeling your best is likely high on the priority list. Planning for prom involves finding the perfect dress and the best hairstyle that expresses your style. Having long hair leaves you with many options! 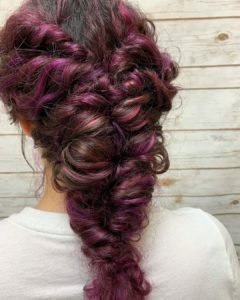 From an all-down to an updo and in between. How thick is your hair? 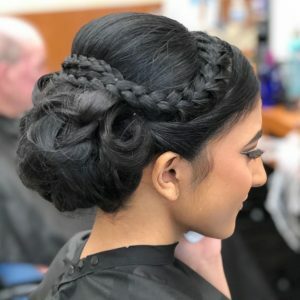 Try looking at photos of prom hairstyles that seem like they might be comparable to what your tresses are like (it can be a little tricky to tell when the hair is all up). 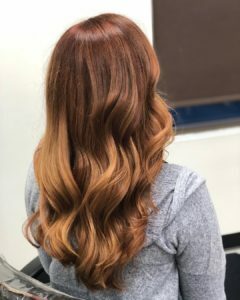 If you find a style you love but know you don’t have thick enough hair, you could talk to your Hair Cuttery Professional about some clip-in extensions (if you already have them, bring them along!) or using a hair donut to add bulk. Don’t discredit a style you really love because there might be ways to work with it. If you were fortunate enough to be born with thick hair, the world is pretty much your oyster here when it comes to selecting a full, lush style. How long is your hair? If your hair is past shoulder length and beyond, you’re considered having long hair which does make updos easier. The longer your hair, the more elaborate you’ll be able to get with an updo as most of the pieces will be able to be pinned up. 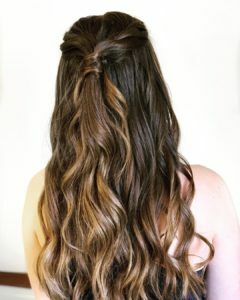 If you prefer to leave your hair down, many hair lengths will work well. Now you just need to decide if you want it all up, all down or somewhere in between. When making this decision, think about how you feel comfortable—is your hair usually pulled back or worn down? What does your dress or formal attire look like—is it high on the neck, thin straps, strapless, etc.? Are you someone who gets hot easily and would benefit from keeping your hair up? For a formal occasion, it is quite common for a beautiful updo bringing all your hair together and off the shoulder. Three things seem to be quite common now: braids, buns, and whimsical—could be one, two or all three mixed together. Braids are timeless and can be incorporated into numerous styles. 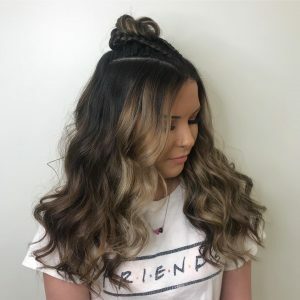 There is a traditional three-strand braid, a Dutch braid, a fishtail braid, and a twist braid to name some popular looks. Really, a braid is simply when strands are interlaced. If you want to style with braids, one could be the main focus of your style or they could be accents throughout. The higher the better is the motto for buns these days. And a very elegant look they can create. A super sleek style pulled back into a high bun would be great for a high-cut dress or someone who simply doesn’t want to worry about their hair falling limp throughout the night. The bun itself could be messy, smooth or somewhere in the middle. Also, there is no “rule” for where the bun needs to sit on your head—a low bun is elegant and classic and a side bun adds a stylish asymmetrical look. Whimsical styles can incorporate both braids and buns or be a totally separate style. There is no set way the hair needs to be gathered to be considered whimsical, it’s all about how the hair hangs loosely around your face and over your ears as it sweeps back to where it is gathered. Sometimes this look has pieces hanging down throughout, just along the face, or just where it is gathered. There is also a varying degree of texture that could be achieved depending on your hair and desires. A prom dress with less detail around your neckline and shoulders, such as a strapless or low-cut style, pairs nicely with a hairstyle that is all down. Or maybe you simply prefer the comfort and appearance of your hair down. Let’s say you have really curly hair and almost never wear it straight because it’s so much work—or your hair is straight but whenever you curl it yourself you feel it never comes out right. 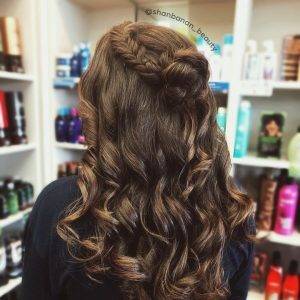 These are perfect scenarios to let a Hair Cuttery stylist make your down prom hairstyle look like something out of the movies. Wearing your hair down is not isolated to simply straight or curly looks. Curls can range from tight to loose, traditional to beachy, and intact to brushed-out. Straight hair can be styled pin-straight or with varying amounts of bend and wave. One trending style includes a finger wave which gives an elegant, classic look to many down styles. This look has a very sleek, face-framing bend that can be loose or tight. It works best if you’re hoping to achieve a smooth down style with a moderate wave. However you choose your long hair to be styled down, an additional way to jazz up the look is to play around with your part. If you always part on the left, try on the right for this night, and vice-versa. Moving your hair in ways it isn’t used to laying will create more volume at the part line. Another option is to try a more severe part or middle part. Don’t be afraid to play around! You can’t decide if your prom hairstyle should be all up or all down, so do a little of both. If you like the idea of the majority of your hair down, choose your favorite down style and ask for some face-framing pieces to be swept back. This will give you the feel of a down style but will allow your face to be exposed a bit more and will help keep hair from falling forward. Second, if you want a pretty solid split of hair up and down, go for half up. You will need to decide how you want the front and top of your hair swept back and if you want it gathered high or low, tight or loose, etc. Then for the hair that’s down, do you want it curly or straight and to what degree? 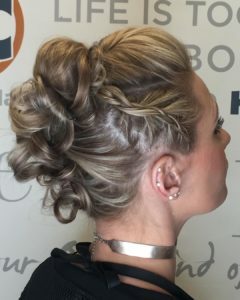 This is a common style and kind of the best of both worlds because you get to incorporate your favorite updo and down style. A third option would be most of your hair pulled back with a little down. Sometimes this is created to look a bit like a ponytail, but a full one as there is nothing holding the hair into an actual grouping. 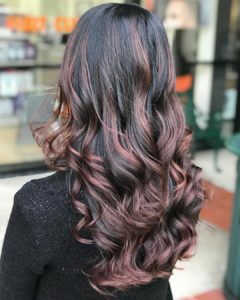 This style would work well with the whimsical look where the hair is loose and textured to create a long, flowing appearance; though there could be many options to this. Any of these three in between hairstyles can incorporate the above-mentioned updo trends: buns, braids, or whimsical. There are so many prom hairstyles to choose from to make this special occasion perfect. Bring your favorite photos and ideas with you to help your Hair Cuttery stylist know just what you’re thinking. Enjoy the night!